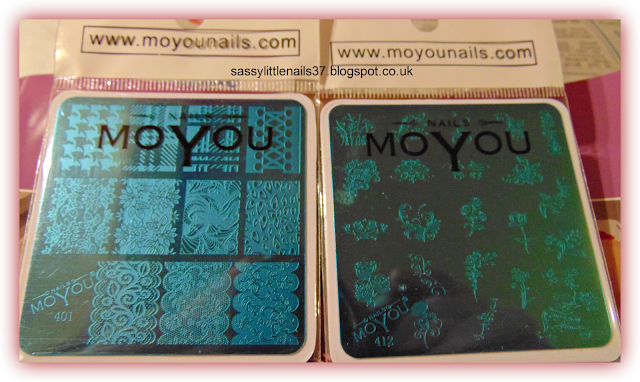 Hi friends I have another review for you this week from Moyou Nails. It is the square stamping plates from the new collection. Looking for a classy lace manicure? 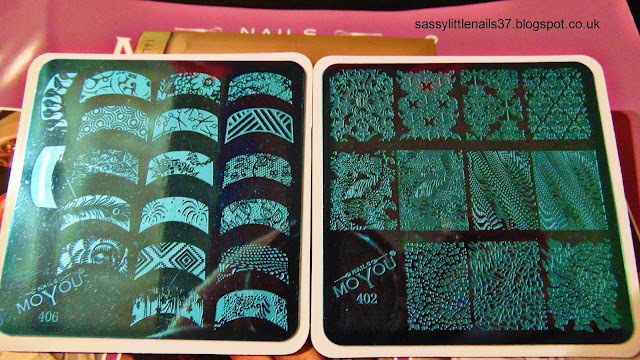 Well MoYou Nails stamping plate 401 has the right designs! With our classic full designs, from floral designs to hounds-tooth, you’ll have endless fun. Also, our new flattering plate comes with double the designs than our smaller plates! The designs size range from 0.5 x 1.5 cm to 1.5 x 2 cm. 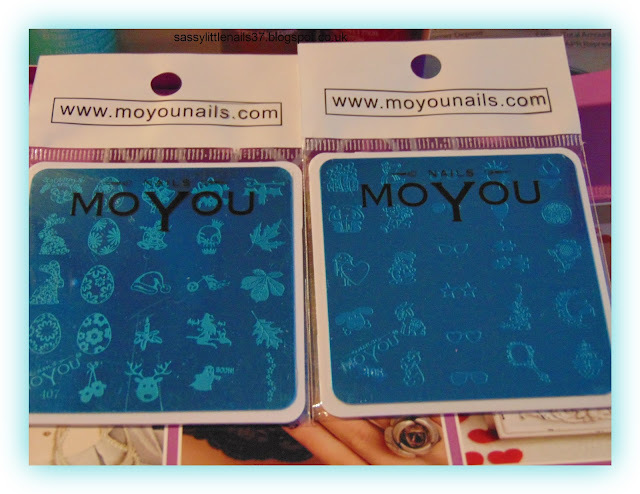 For beautiful small floral nail art, MoYou Nails image plate 412 is perfect. Add some lush details to your manicure for gorgeous filigree patterns. Make your nails look beautiful with MoYou Nails and bring your favourite flowers to your nails. 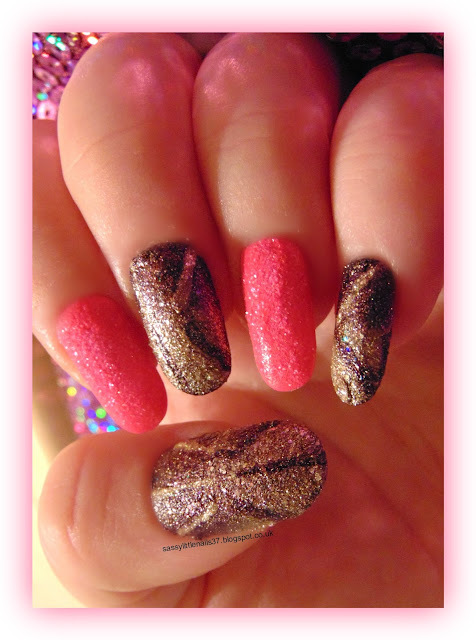 The designs size range from 0.5 x 1.5 cm to 1.5 x 2 cm Items I used for this Nail art review are listed below. Tarastalons indie brand glitter polish in Gold dust. B&M neon polish in green. I Began with a base coat then I painted a few square shapes on the thumb and middle finger nail using the green and red polish. Once dry I then used the white polish to stamp the plaid pattern onto the nails. was tricky but I did my best and gave the 2 nails a matte top coat! Then I gave the pointer and the little finger nail 2/3 coats of the green polish when dry I stamped some gold patterns onto the nails. I then gave the ring finger 2 coats of gold polish then when dry I used the tarastalons glitter gold over it. 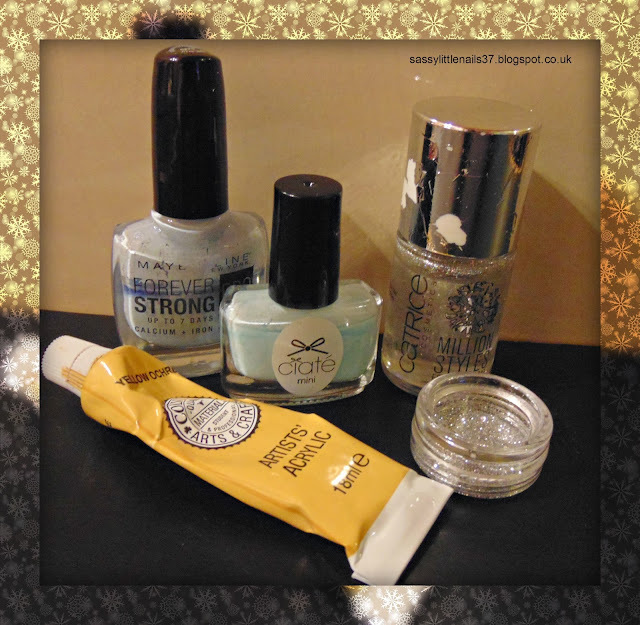 Many thanks to Moyou Nails for sending me these items for this review! More Moyou Nails products review next week! Thanks for sticking with me this year and I wish you all a wonderful happy healthy kind prosperous successful 2016! Hi my festive friends! I hope you all are excited for Christmas! I know I am and there is some more wrapping to do but I am almost done! 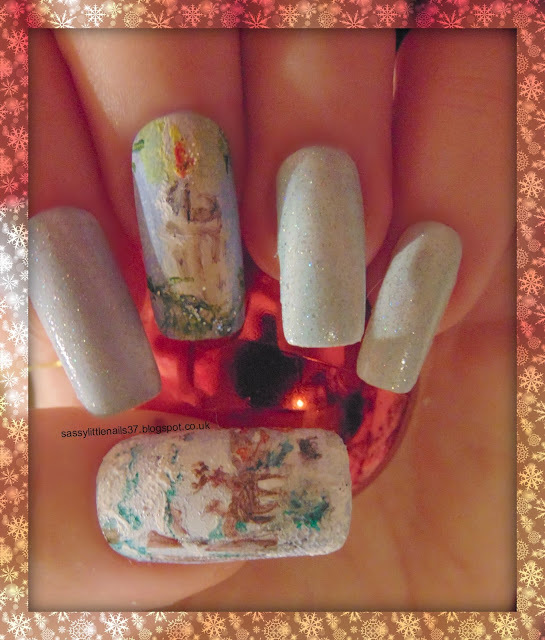 This weeks 40gnai theme prompt is Christmas and I thought I would do a freehand of Santa and some snowflakes. The items are listed below I used for this nailart. Revlon polish in Pale cashmere. Barry M paint in Damson. various Acrylic paints and brushes. BP snowflake stamping plate stamper and scraper. Color Club holographic polish in Harp on it. I began with the pointer and ring and little finger using a gradient effect using the Revlon polish and Barry M and the Laval polish applying it onto a makeup sponge then onto the nails.I repeated this step about 3 times. Then when tacky I went over the nails with the clear top coat. Once dry fully I then used the Color Club polish to stamp some snowflakes onto the nails. 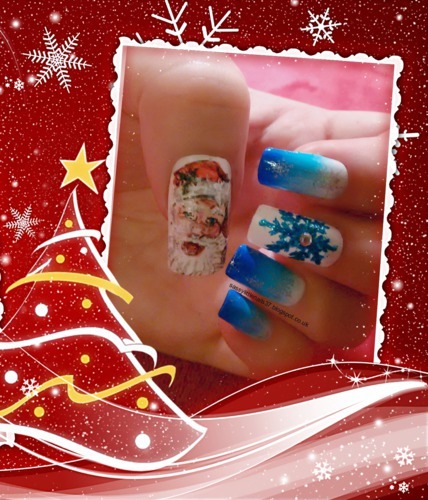 I then started to paint santa on the thumb nail and then used a light blue on the middle finger to create a snowflake and then went over it with the glitter striper.stuck on a nail stud in the centre. 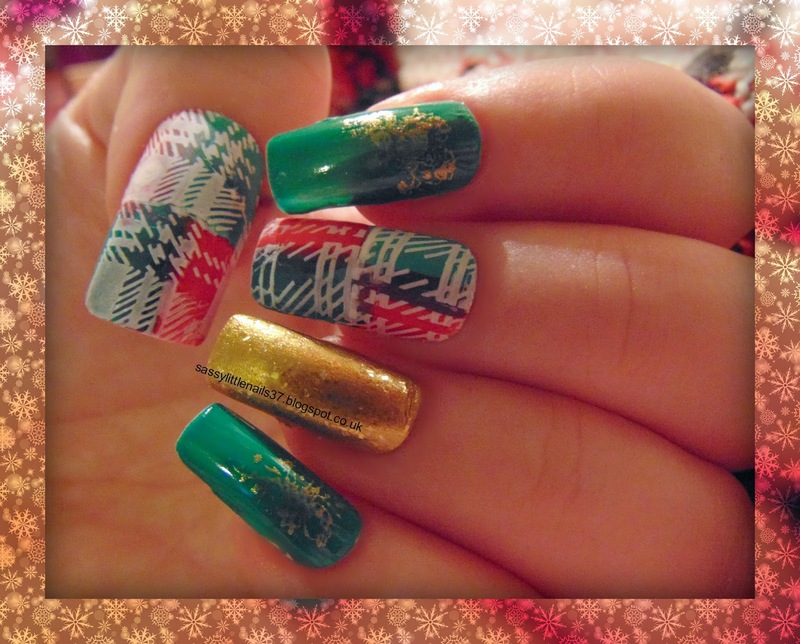 I hope you liked this festive nailart! 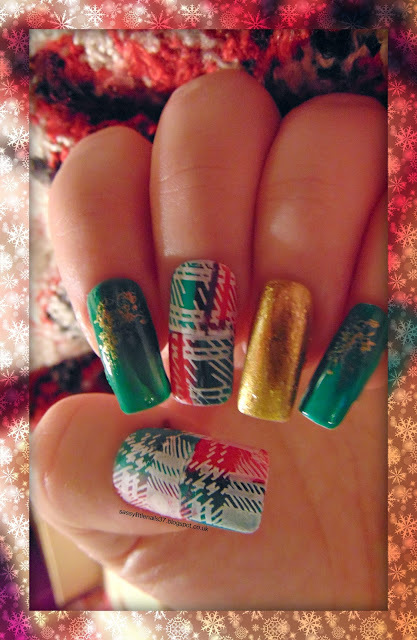 Please do check the other fabulous festive nailart below! May I wish you all a very Merry Christmas and a very Happy and healthy New year! Hi friends I was searching through the Next online web site and thought I would create a new fashion outfit wishlist for this Wintertime. Bouclé Coat with Detachable faux fur collar. Stylish ribbed roll neck dress in a flattering fit and shape. I think this outfit would be nice and cosy warm for those chilly cold days. I love the Coat and dress and boots I also like the fact that Next has catered the fashion for plus sizes. 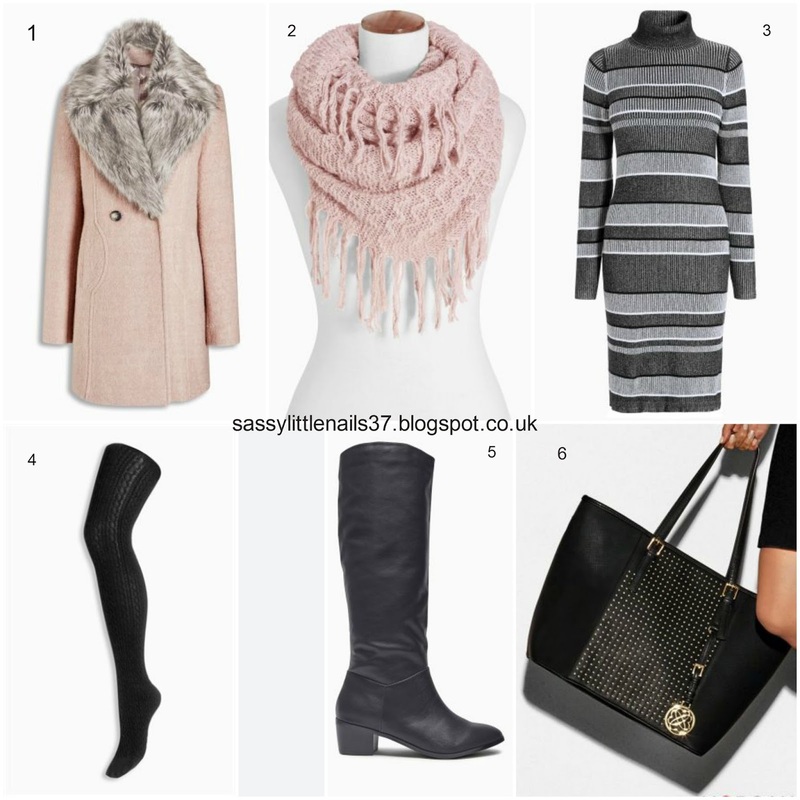 What is your must haves for your Winter wardrobe? Hello friends I have this weeks challenge mani for you! 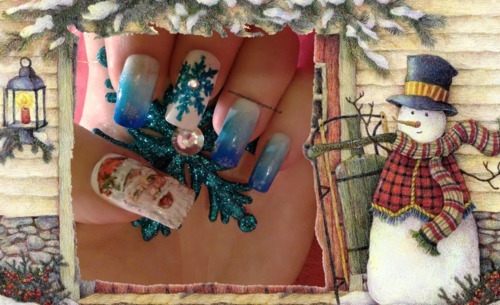 This weeks prompt was winter theme and I chosen to do a winter scene Christmas theme type of mani on my nails using acrylic paints and some polishes and glitter! 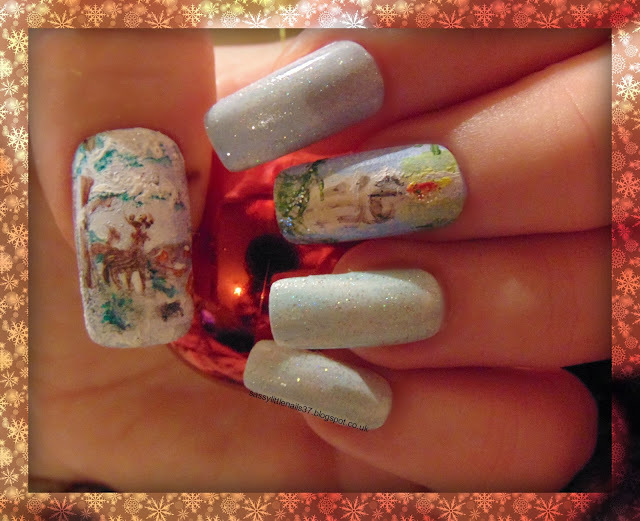 I used various colours of paints freehand to create the scene of landscape snow and some deers the middle finger is a lit candle. I sprinkled a little silver glitter onto the branches and snow on the scene, the other nails was ciate polish and maybelline polish very similar in colour and Catrice glitter topper on top of it. It's not one of my best to be honest having a bad back doesn't help but I managed to finish this nailart and it's turned out well. 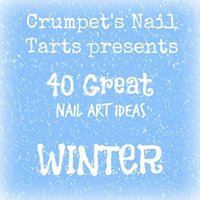 please take a look at the wonderful manis below. Thanks for stopping by. Hello friends Hope you all doing well and getting into the festive spirit! I have my 3rd review for the Moyou Nails square stamping plates from the new collection to show you! Our scaly new designs and some traditional pieces from our older collection formulate our beautiful new plate 402. The miniature salon pro board is handy when it comes to the range of designs and its size. With 11 different designs, you’ll never go tiresome after a session with MoYou Nails. Try the classic French manicure with a twist using MoYou Nails stamping plate 406. 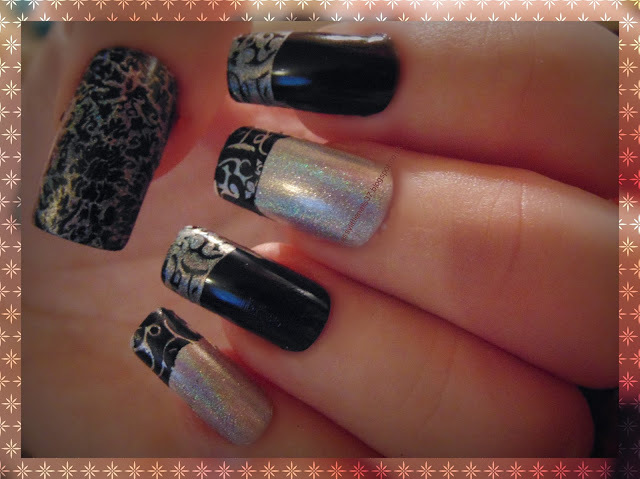 Add either a lace or optical illusion design to create multiple designs for your manicure. With our bigger board you’ll have 19 designs to choose from and the new plate shape will inspire you to change up your manicures. The designs size range from 0.5 x 1.5 cm to 1.5 x 2 cm. Items I used for this easy fun Nail art review are listed below. I started 2 coats with the thumb,point and ring finger using the black polish. then on the middle and little finger I applied 2 coats of the holographic polish. I then used the holo polish to stamp the french manicure images onto the other nails! thats it simple and yet fun for the party season! Thanks to Moyou Nails for sending me these items for this review! Thanks for reading have a lovely day! 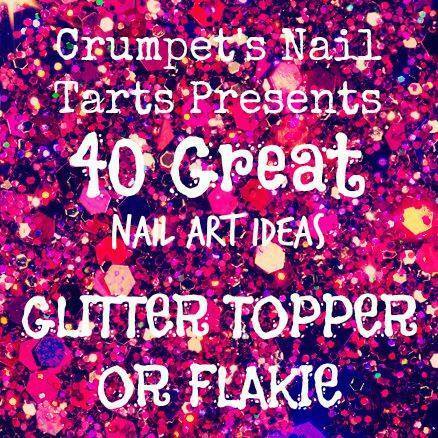 Time for this weeks challenge which is Glitter topper or flakie! I chosen Glitter and the Pattern prompt for me was a Reciprocal gradient. I have never really tried this technique with a gradient effect before so I was eager to give it ago. Here are the items I used. Ciate glitter in Neon Glitter. Sally Hansen polish in Starcrossed. Barry M textured effect polish in Countess. 2True sequins glitter polish in Tyra. Nail art tape and nail guides. I started with a white base coat then when dry I created the gradient effect using the 2 polishes Barry M and 2True on to the makeup sponge then applying them to the thumb and middle and little nail. I did this step about 2 times then when dry fully I placed the tape on the nails and went back over the nails with the make up sponge but this time tuning the sponge the other way so the darker colour is on the light colour to create the reciprocal gradient effect.. Carefully removing each tape while wet.I then went over the nails with the Sally Hansen glitter polish. The pointer finger and ring finger I used 2 coats of the Ciate polish then while wet I sprinkled on the Ciate glitter. I did struggle a bit with the glitter polish and the tape Not one of my best but I do like the colours together. Please check out the other wonderful nailart below! Hope you all keeping well. 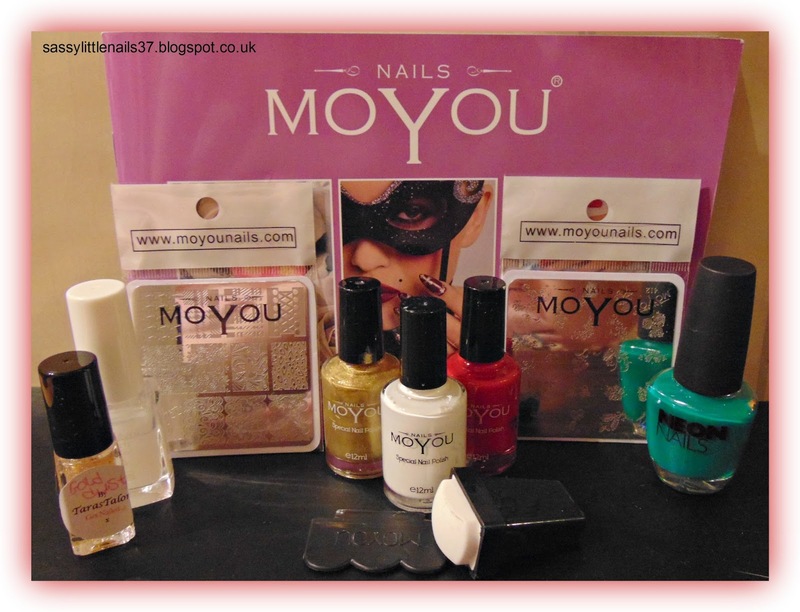 Today I have another lovely review for you from Moyou Nails. I was sent some great Square stamping plates from the collection which I will be brining you each week. The multi-festive plate is here! 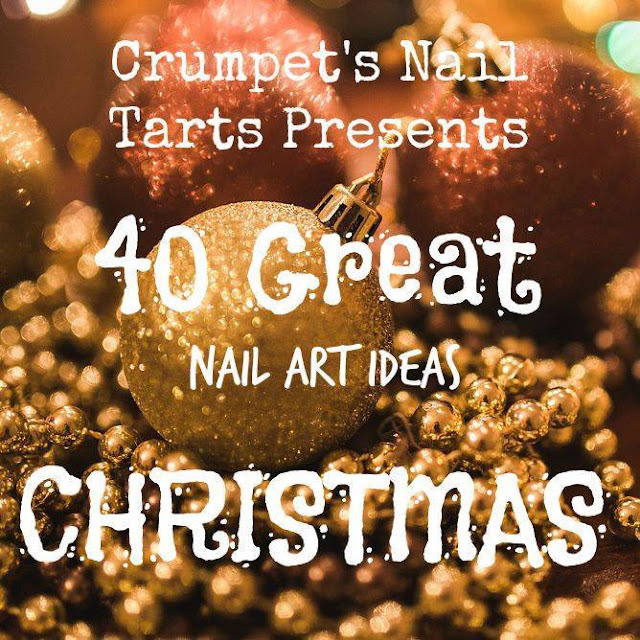 With fabulous designs for a Christmas, Easter or Halloween specialty, MoYou Nails stamping image plate 407 has the perfect designs. If you are looking for beautiful Easter egg nail designs or spooky Halloween manicures, this MoYou Stamping plate is the one. Looking for cute, funky nail designs? Look no further, MoYou Nails has created a new image stamping plate 408 on a brand new plate size with fabulous designs. 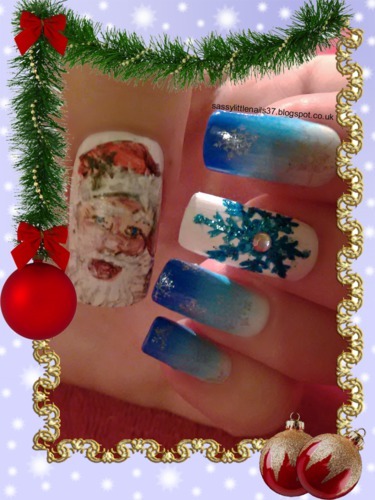 For funky nails art we have a range of cool sunglasses, gifts, cute animals and an adorable snowman. 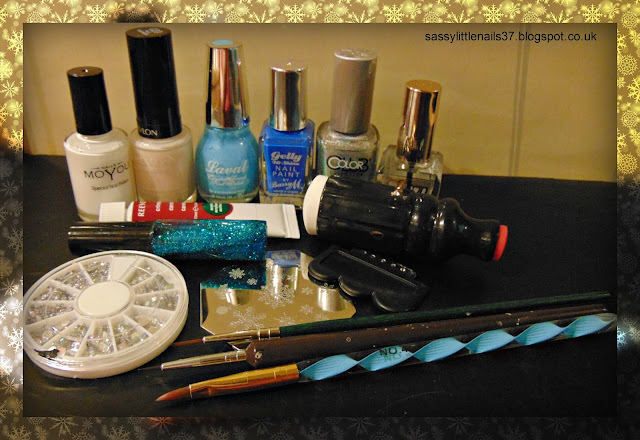 Items I used for this easy fun Nail art review are listed below. Ciate polish in Ferris wheel. Essence effect polish in Awesome blossom. Wet n Wild polish in Caribbean frost. 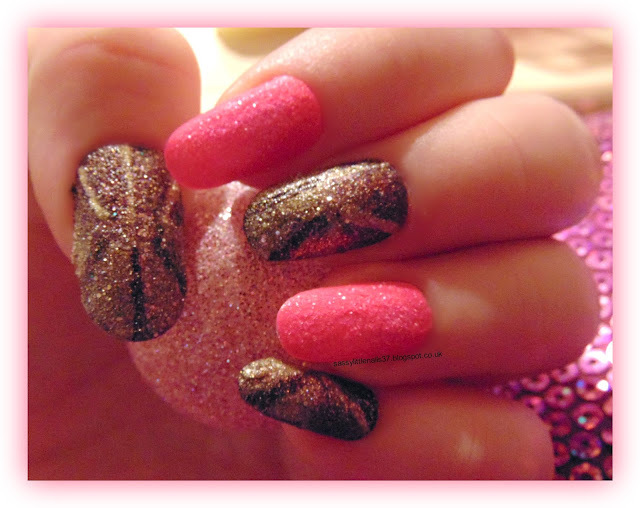 I began with a gradient effect using the makeup sponge and the Ciate polish and the rimmel polish on all nails. Then I applied the 2 polishes to the sponge and dabbed on each nail, I repeated this step about 3 times. Then while wet I blended the colours to smooth the effect using the clear top coat. Once dry I then began stamping using theWet n Wild polish and the white polish and gold, brown and red, for the snow effect I used the Essence polish. 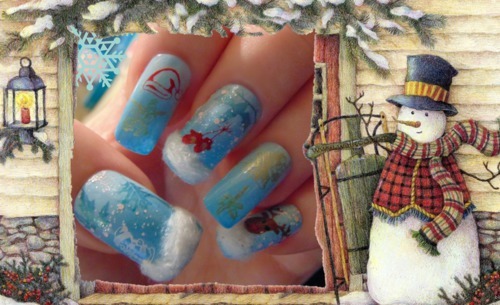 I stuck on some cotton wool on the bottom of the nails for a fun snow effect lol.